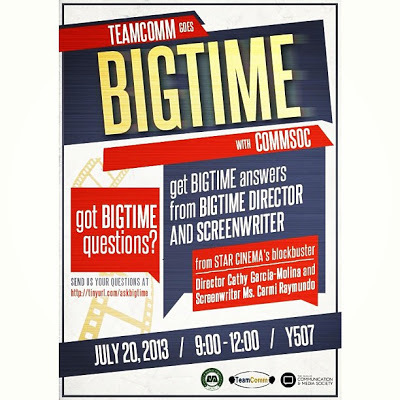 TeamComm and COMMSOC of De La Salle University are bringing a BIGTIME DIRECTOR and a BIGTIME SCREENWRITER in the campus! This will happen on July 20, 2013 from 9AM-12NN at Yuchengco Hall, Seminar Room 507. Get BIGTIME ANSWERS from Star Cinema's Director Cathy Garcia-Molina and Screenwriter Carmi Raymundo!